I recently visited Santa Fe with some friends. When we go there, we always seem to wind up at the Georgia O’Keeffe Museum. Although most widely known as a pioneer of American Modernism and for her large format paintings of blossoms, she also revolutionized the way people viewed landscapes, especially New Mexico landscapes. Many tourist guides now refer to the landscapes of northern New Mexico as ‘O’Keeffe Country’. One of the popular exhibits mounted in the last decade is titled ‘A Sense of Place’ and is composed of more than 50 New Mexico landscapes. The phrase, “a sense of place” was originally coined by by Yi-Fu Tuan, a Chinese-American geographer (b. 1930), who worked in New Mexico and was a professor at the University of Minnesota and the University of Wisconsin. He proposed that a place comes into existence when humans give meaning to a part of the larger, undifferentiated space. When a specific location is named, it is separated from the undefined space that surrounds it and thus acquires a "sense of place." Tuan referred to places that lack a "sense of place" as "placeless" or "inauthentic." Placeless landscapes are those that have no special relationship to their societal and geographic setting—they could be anywhere. Roadside strip shopping malls, gas stations, fast food chains, and chain department stores are often cited as examples of placeless landscape elements. I was struck by the similarity between the way O’Keeffe’s paintings assigned a sense of place to a specific location and what we should be doing with Ecological Sites. She very eloquently identified and communicated, via paint and canvas, what makes a place special. She did it by simultaneously focusing on a particular piece of land and on the relationship with its surrounding landscape. In a very real sense, that is what we do with our Ecological Site Descriptions. While it is important to describe a soil:vegetation combination as an identifiable unit, we are also trying to place that combination of attributes into the context of other sites, the larger landscape, and to communicate the important interactions that result in the ecosystem services to our society. Our tools may not be paint and canvas and we may not have the artistic leeway or talent of Georgia O’Keeffe, but we have access to a variety of tools to communicate the specialness of that site, both by describing its unique nature as well as its context. The most important of these tools is creativity. Reducing an ecological site to a predetermined and prescribed set of numbers really does not do justice to either the site or the surrounding landscape. Another impressive exhibit at the O’Keefe museum was the temporary show “Georgia O’Keeffe and Ansel Adams: The Hawai’i Pictures”. As you might imagine, both the images and subject matter was majestic and inspiring, but the accompanying explanations went to great length to explain how difficult it was for O’Keeffe and Adams, both already world-renowned artists, to adapt their techniques which had been perfected in arid landscapes, to the water-drenched, green landscapes of Hawai’i. So our challenge in describing landscapes using Ecological Site concepts is not necessarily to crank out a series of predetermined measurements to report, but rather to understand the landscape sufficiently well to adapt and apply a set of basic principles, describe the functions and relationships within the site and surrounding landscape via interpretations of measurements, and communicate that understanding to a variety of users. Now that would be a masterpiece. 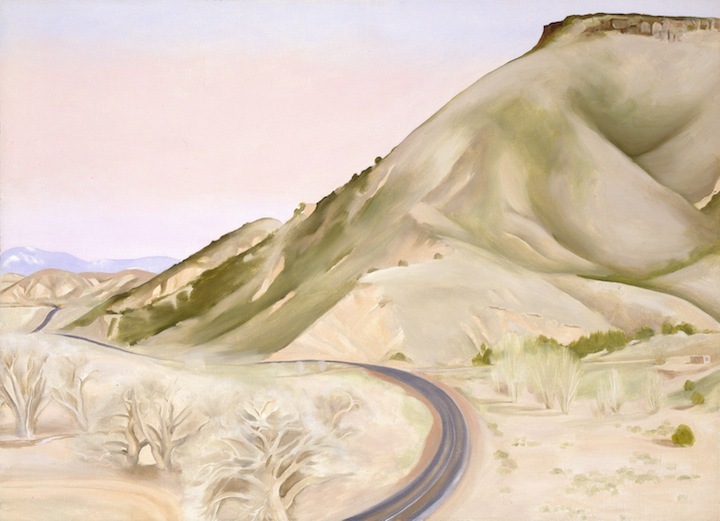 Image credit: Georgia O'Keeffe, Mesa and Road East II, 1952. Oil on canvas, 26 x 36 in. Georgia O'Keeffe Museum. Gift of The Georgia O'Keeffe Foundation. Copyright Georgia O'Keeffe Museum.